Are you on the quest to ditch your laptop when you're on the road? Do you want to seamlessly transfer Microsoft Excel files to/from your Visor? Then check out TinySheet by iambic Software. TinySheet is currently the only Palm OS spreadsheet available that is color-enabled. Visor Prism owners will enjoy features like the ability to colorize cells, rows, columns, or text. Visor Deluxe and Platinum owners can still use TinySheet, but it won't have any color features. TinySheet can use workbooks with multiple sheets (no max. ), and each sheet can have over 65000 rows and columns up to IV. 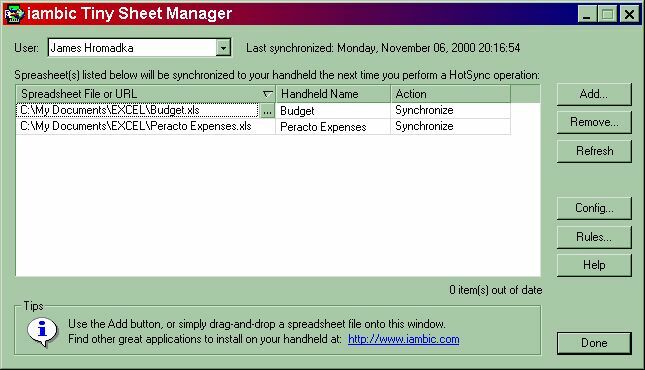 The first thing I tested was how well the TinySheet Manager desktop software handled Microsoft Excel 2000 synchronization. The conduit also synchronizes with CSV files, tab-delimited files, and HTML tables. Adding files was easy -- either drag-and-drop files from a My Computer window into TinySheet Manager or use the Add button and browse to the file. Spreadsheet files that you create on the Visor will be placed in the default directory that Excel uses (Tools | Options | General). File synchronization is fairly fast with TinySheet. Installing a new 85 Kb file to the Visor took about forty seconds, and minor updates took less than a second. I did have some problems at first with the conduit, but a reinstallation corrected the problem. Now I can finally carry our budget and other important Excel files around on my Visor. How well did the conduit synchronize my Excel data? Better than expected. I like to use color and borders in my Excel documents, and the first time I HotSynced our household budget over, I was surprised to see that color (text, cell) and font changes (bold, etc.) came over to TinySheet as well. For monochrome users, formatting (bold, etc.) still comes over, as you can see from these two screen shots from TinySheet in color and monochrome. Not everything is synchronized, however. I noticed that border shading in Excel didn't transfer to TinySheet. Also, the TinySheet conduit is free, but unfortunately there is no Mac support.